As a university student who lives off campus at Oklahoma State University, riding a bike is an excellent way to navigate the campus and the town of Stillwater. That said, I admit that I do not always feel safe riding on the streets. Many cities, such as Washington, D.C. where I spent the summer interning for Safe Kids, have several miles of networked bike lanes. I can feel safe riding from where I’m staying to the office or to the gym. Austin, Chicago, Philadelphia and many other cities have large and growing bike networks. Stillwater, however, has very few bike lanes and none of them are protected. Parents do not feel safe when their children are riding in streets, even if the school is only a short distance from their homes. That is unfortunate because cycling is a great way to stay healthy and fit. Protected bike lanes provide higher levels of confidence. Surveys show that parents and children feel safer and are more willing to ride on the road if there is a protected bike lane. On Austin’s Bluebonnet Lane leading to Zilker Elementary School, bike use increased by nearly 50 percent after constructing a protected bike lane. Not only do we feel safer, we are safer. As the bike infrastructure in Minneapolis grew, its bike crash rate per 100,000 trips plunged 75 percent and the rate of severe injuries and fatalities fell 79 percent. Bike lanes nationally cut injury risk by 50 percent, and protected bike lanes cut it by 90 percent. Lobbying your city government to build a protected bike lane in your school zone may seem daunting. How can I reach a city/community official? Can the city afford this project? Will others support me? If questions like these have crossed your mind do not fret, Safe Kids Worldwide has created a toolkit that will answer these and many more questions for you. 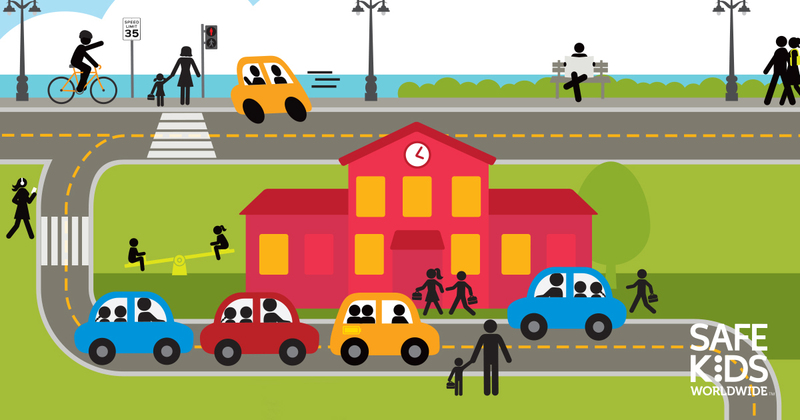 The Take Action Toolkit: How to Fix an Unsafe School Zone is designed to help make smart public policy and save lives in school zones. It starts with a virtual map of a school zone with six danger areas; for example, places that lack a bike lane infrastructure or a dysfunctional drop-off/pickup area. You can click on the school zone risk area you’re interested in, which will open a very detailed but easy-to-follow action plan for making change. The action plans have model letters, sample social media posts, persuasive facts and data and much more. You can go to the Build a Bike Lane Action Pan and start riding your way to safer biking in your community. When it comes to bike lanes, you may already have a head start. Many communities are already investing in bike safety infrastructure. They enhance safety and provide an economic development benefit since bike friendly communities bring tourism dollars and encourage business relocations. Thus, rather than having to convince leaders to build new bike lanes, your challenge might be adjusting routes to include your school zone. This action plan and others have been created to help parents and communities improve safety standards. We plan to update them regularly and urge everyone to take advantage of these resources. If you have any questions, please reach out to the public policy team at agreen@safekids.org and areich@safekids.org. The Take Action Toolkit: How to Fix an Unsafe School Zone was proudly sponsored by FedEx.